SIMPLE SYRUP (1:1 ratio) 2 OZ. 1) Melt white chocolate over a bain-marie to 100F. Allow the chocolate to cool to room temperature. 2) Separately, whisk together the glucose and simple syrup and heat to 90F. Pour this mixture over the white chocolate and stir together until uniform. 3) Pour mixture into a bowl, cover the surface with plastic wrap and allow the mixture to rest for 24 hours at room temperature. 4) The next day, knead the modeling chocolate until pliable. The modeling chocolate is now ready to use. 1) Knead the modeling until pliable. 7) The next row of petals consists of 5 rounds surrounding the bud. Repeat the same technique as above. But for a natural look, gently curl back the right edge of each petal. 8) The next row of petals consists of 7 rounds surrounding the rosebud. Repeat the same technique as above. 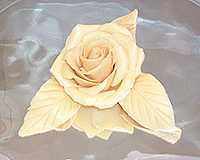 But for a natural look, gently curl back both edges of the petal. 9) Finally, using both hands gently taper the sides of the rose to look more delicate. Use scissors cut-off any excess modeling chocolate from the bottom. 10) Create leaves by cutting-out leaf shapes with a knife. 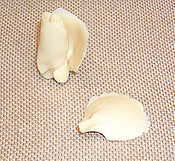 Cover them with plastic wrap and taper the edges with your finger. Using the back of a paring knife, gently score the top of each leaf to create veins. Curl leaves into natural looking shapes. 11) If the modeling chocolate should become soft and warm while working, simply refrigerate for a few minutes. 12) Store the roses in a clean, dry and cool location. They will last for months! 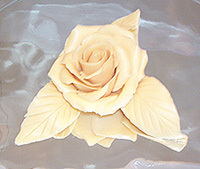 13) Decorate cakes, wedding cakes and chocolate centerpieces with these beautiful "edible" roses!